We’ve learned about Gravity, our planet, Earth, and on our field trip to the Bellevue College planetarium, we learned about stars and constellations that we observe from Earth. This week we learned about the planets in our solar system and about space travel. 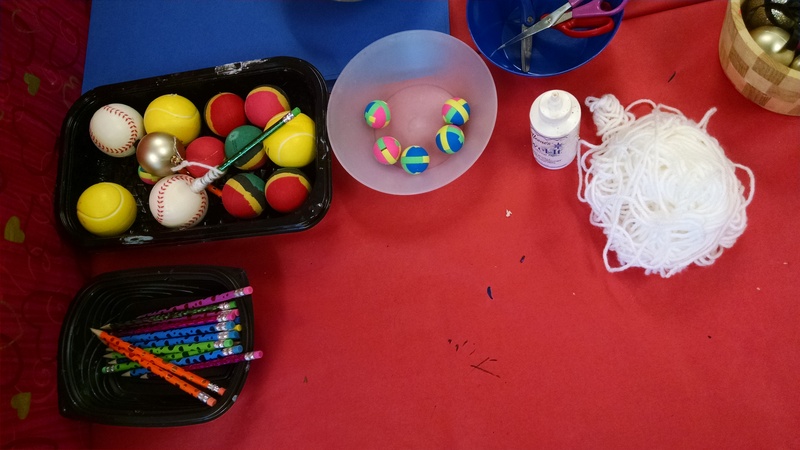 Orbital Models: We wanted the kids to create a model where they could see how the earth orbits the sun, and the moon independently orbits the earth. 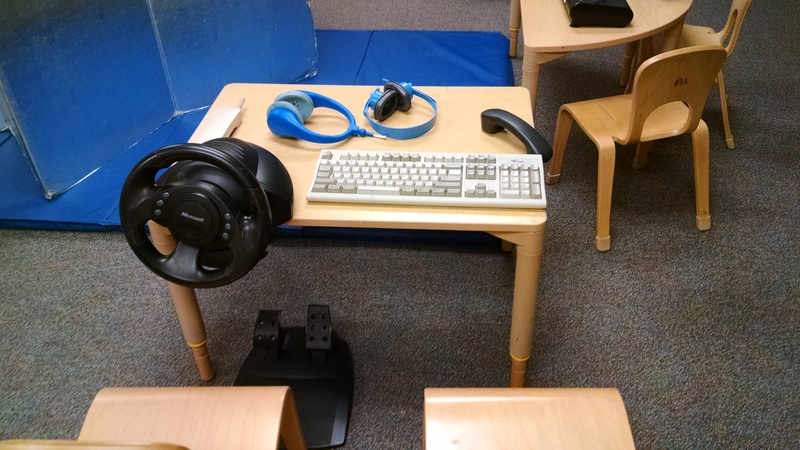 We had three ideas for how to do this, and ended up putting out the supplies for all three options on the table, and some kids / parents got creative and came up with even more ways to model this. 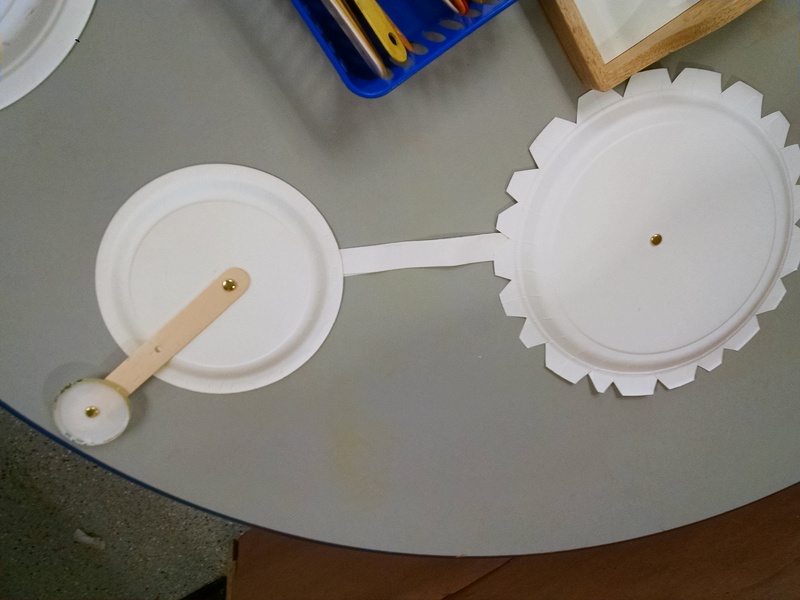 Use a large paper plate for the sun, a small paper plate for the earth, and the bottom of a Dixie cup or a small circle of paper to represent the moon. Decorate them, then cut two long strips of cardstock. Connect the earth to the sun, the sun to the moon. Use a CD for the sun, a juice can lid for the moon, and a bottle cap for the moon. Once you’ve assembled the model, kids can explore how the earth orbits the sun, and the moon orbits the earth. Poke the skewer (or pencil) into a large ball. Tie a string to the smaller ball. Then tie the string firmly to the skewer – slide it up close to the planet. Tape in place so it can’t rotate. You have created a model of a simple planetary system like Earth’s – with one planet and one satellite moon. Try twirling the small ‘Moon’ around the larger Planet on your wand. Observe how, as it draws closer, the moon travels faster around the planet. This is one of the basic principles of Gravity and Orbital Mechanics that every astronaut knows and is an example of Centripetal Force. Martian surface. Kids could trace around a lid from a large tub to make a circle on cardstock, then paint it with Mars goo – paint mixed with flour. They could sculpt mountains and craters in the goo. 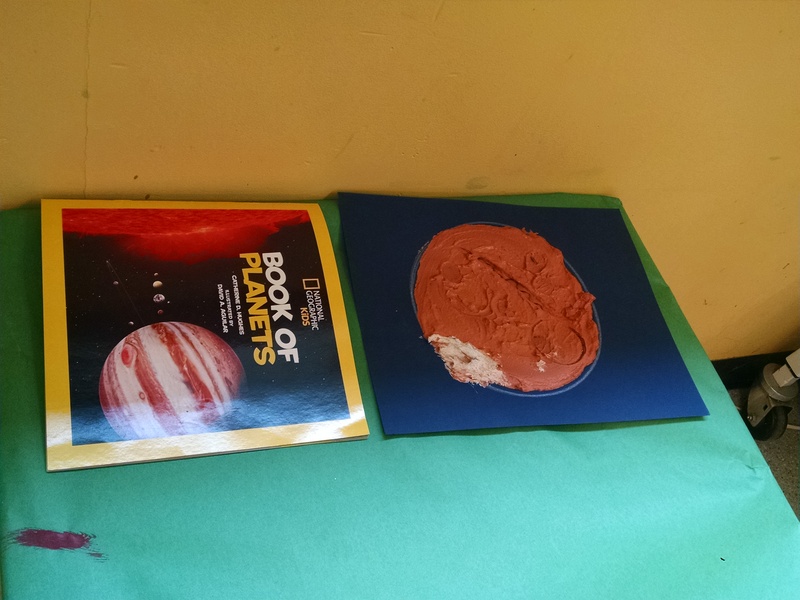 We placed a photo of Mars on the table as inspiration. 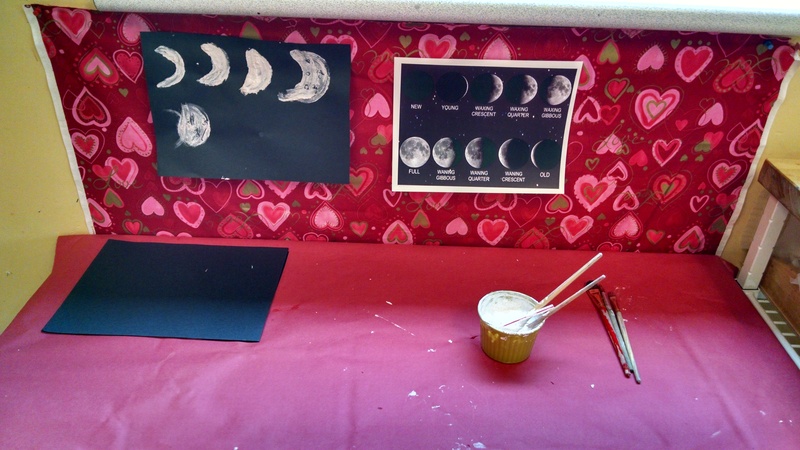 I also really like the idea from Mrs. Myer’s kindergarten, to have the kids work collaboratively on BIG paintings of the phases of the moon. 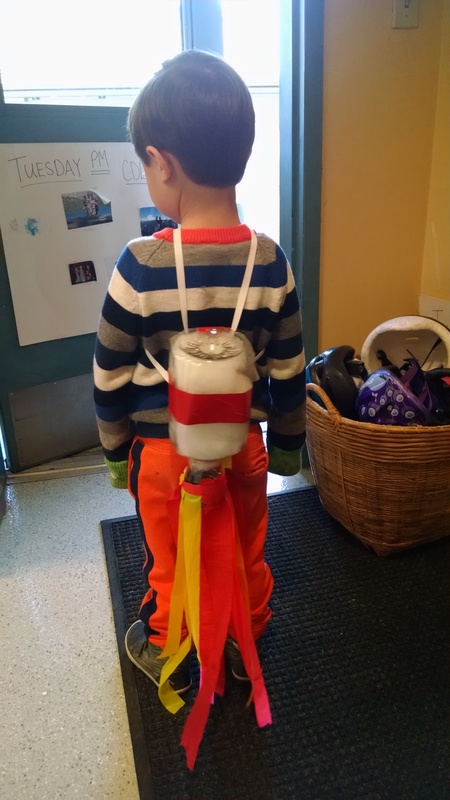 Jet Packs: Search online for home-made jetpacks and you’ll find lots of ideas. Our basic design was: take a clean, dry plastic bottle (juice bottle, 2 liter soda, whatever) or two (if two, you’ll want to strap them together). Fill with bits of Poly-Fil. Put the lid on, then tape crepe paper flames (or felt flames) to the bottom of it. Take bias tape or other strings. Lay them on one side of the bottle in an X shape and tape it on. Decorate, adding buttons and such. Then tie on by putting it on the child’s back, and crossing the ties across the chest. You could also make jet packs or walkie talkies or other “space gear” by covering cardboard boxes with foil and decorating. Solar System Crowns. Cut long strips of black card stock. Measure them to fit around a child’s head with a small gap in the back. Have kids cut out paper suns to glue in the center. 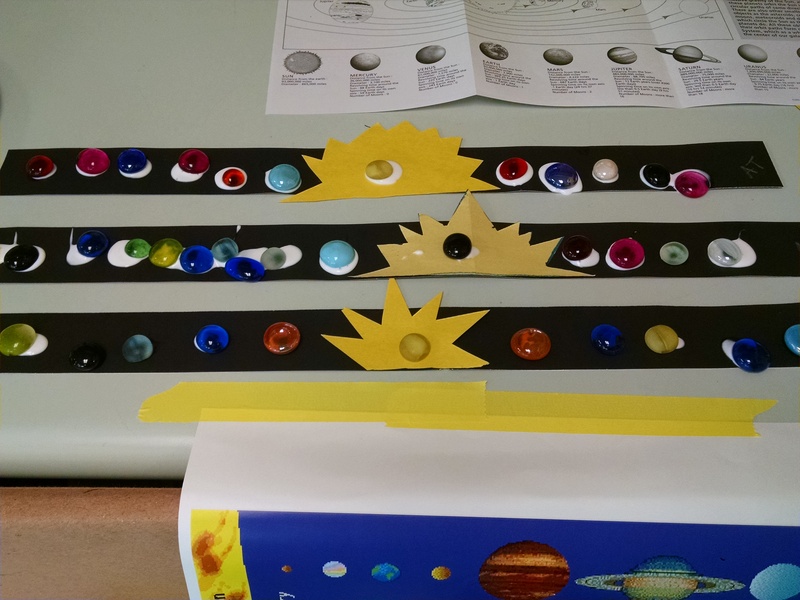 Then glue 8 (or so… ) glass “stones” on to represent the planets. After the glue dries, punch holes in the ends of the band, and tie a string between them so the child can wear it as a crown. We used tacky glue for this project, which works but takes a long time to dry. A hot glue gun would be faster. 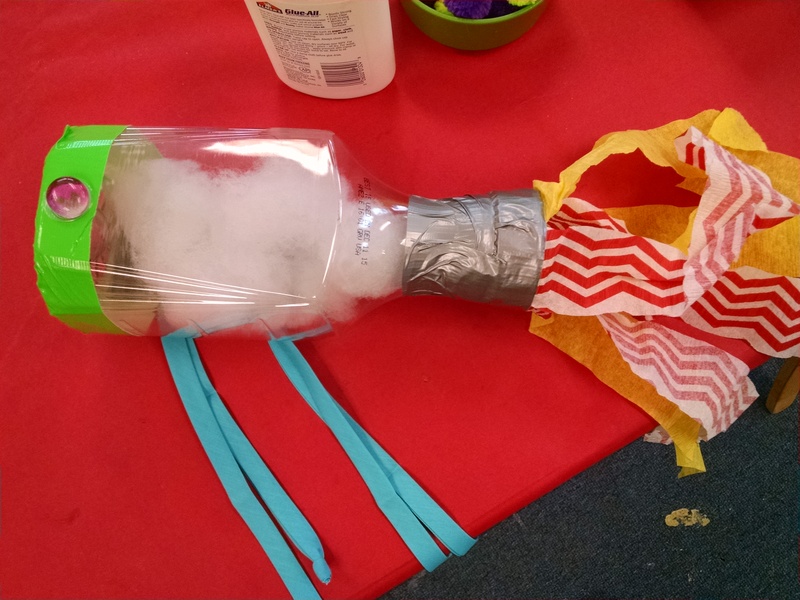 (Read Teacher Tom’s thoughts on allowing young children to use hot glue guns.) 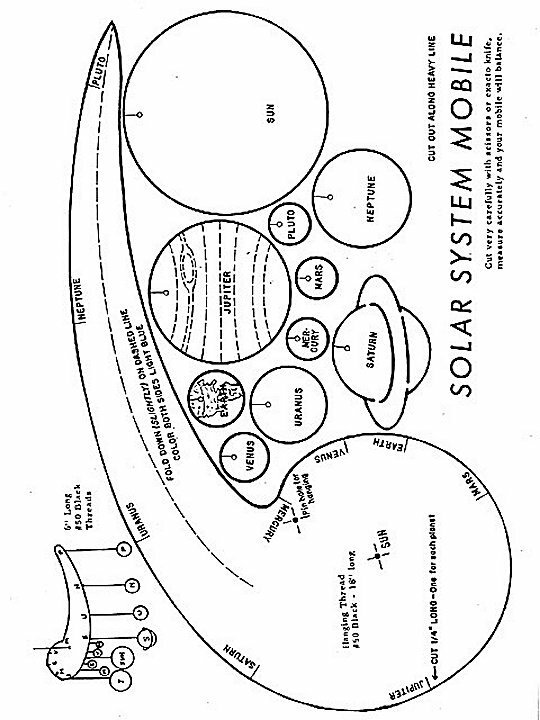 Note that we had a poster of the solar system and a diagram of the solar system out for information and inspiration. 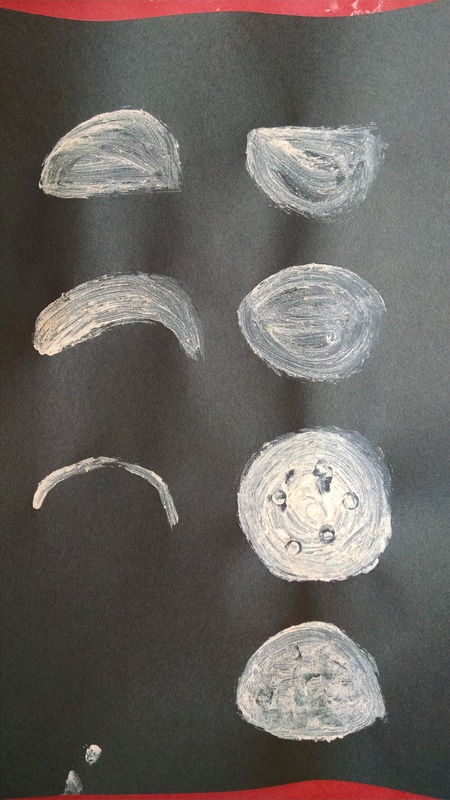 Solar system: this year, we couldn’t find the large heavy black cardstock to make these into crowns, so we just had out big blue paper and stones… kids made some great solar systems with parent’s help. 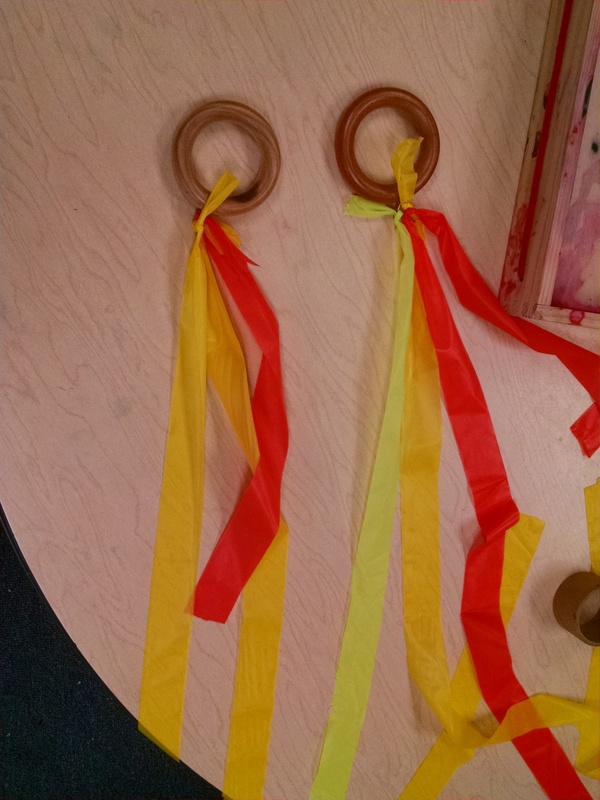 Comet Streamers: We put out wooden rings and plastic ribbon so they could tie on streamers and make a fun toy to run and play with. You shape these rockets around a film canister, but then take the film canister out. 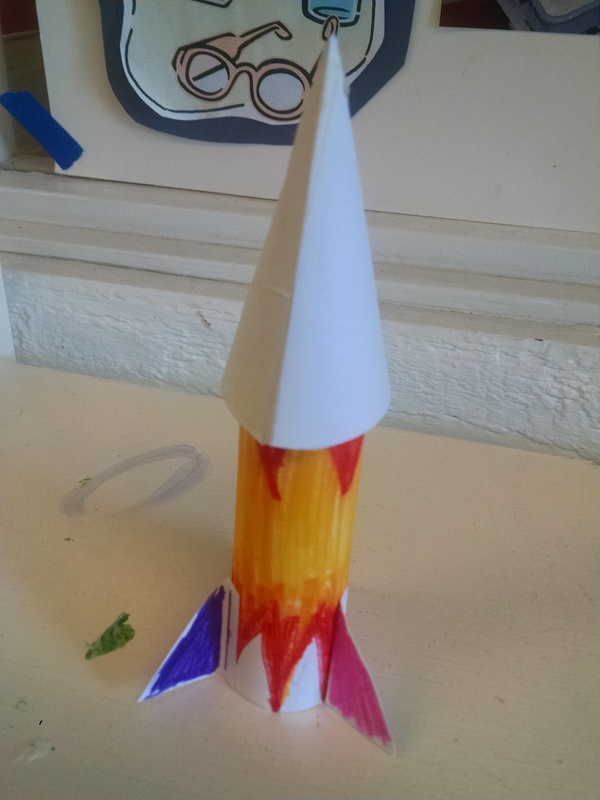 Note: you can use these paper rockets with Alka-Seltzer rockets and launch these up 10 – 20 feet in the sky, but it will soak / ruin your paper rocket in the process… see details here. 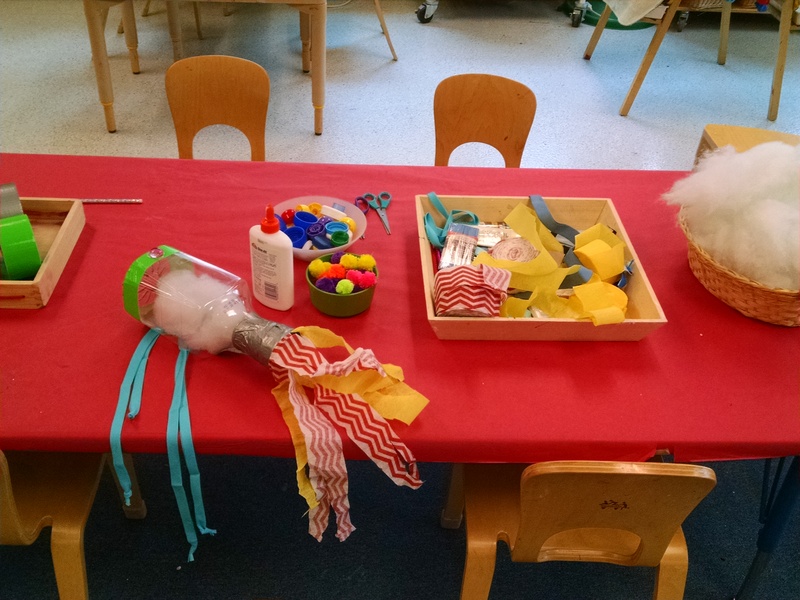 Creation Station: We always have a collage station available in the corner with lots of fun recycled materials, tape, and glue where kids can build anything they want. 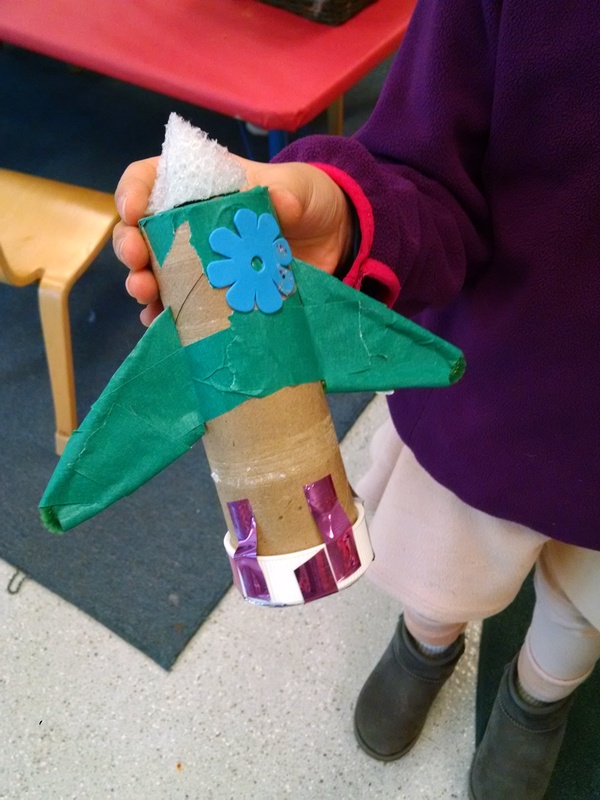 Here’s one student’s rocket ship that she created on a whim. 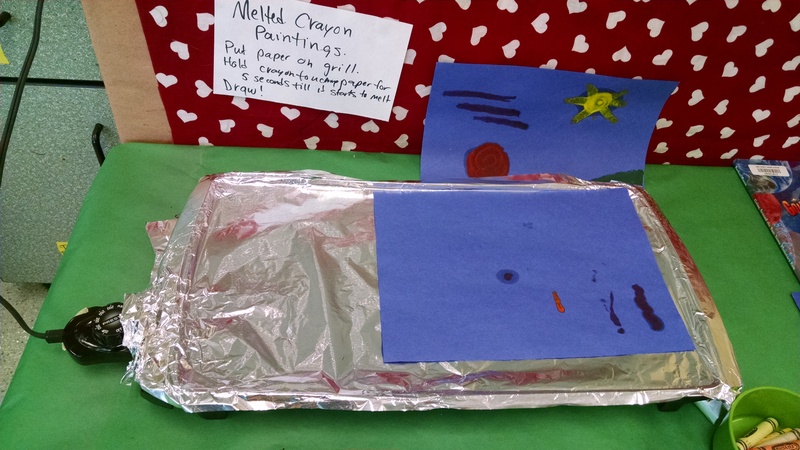 Melted Crayon Art: Cover a griddle with foil, lay paper on top of the heated griddle, and draw with crayon – the wax melts on to the paper. The art inspiration is the book Going Around the Sun: Some Planetary Fun , which I review here. Ideally, we’d make space backgrounds, like in the book, then make colorful planets to place on those backgrounds. Science Activity: How much would you weigh on the moon: Kids were encouraged to weigh themselves on a bathroom scale, then look up on the chart how heavy they would be on the moon and on Mars. 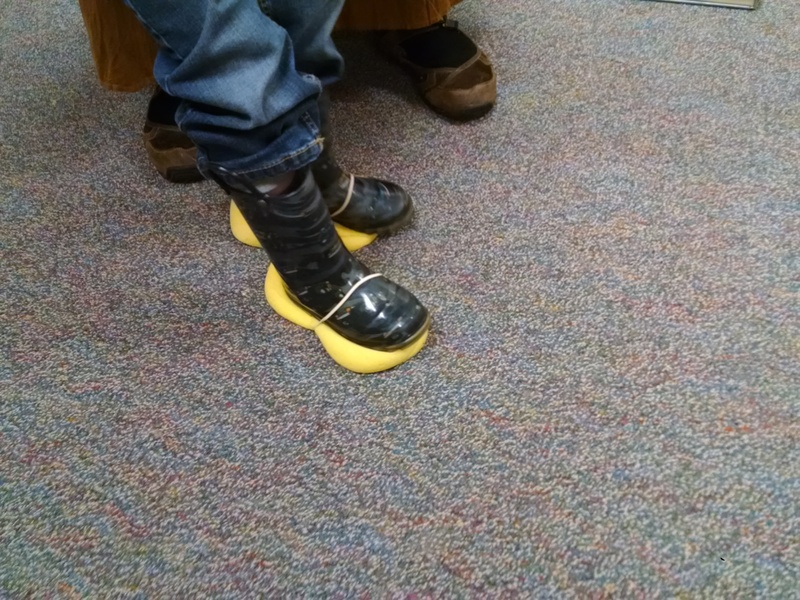 We also discussed this idea in circle. This was interesting to our older kids (6 and up) who have some grasp of what “5 pounds” feels like vs. what “60 pounds” feels like. But, way too abstract for little ones, really. 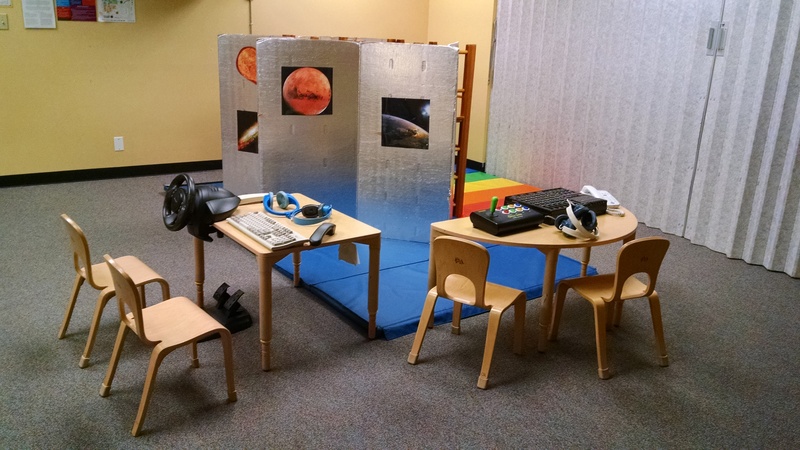 Sensory, Puzzles and Games – In the sensory tub, we had red Kinetic Sand for “the surface of Mars.” We just put in toy cars with good treads to leave marks. Even better would be Mars Rovers, like these from Hot Wheels or LEGO, though it might take a lot of work to clean all the sand out of the Lego. 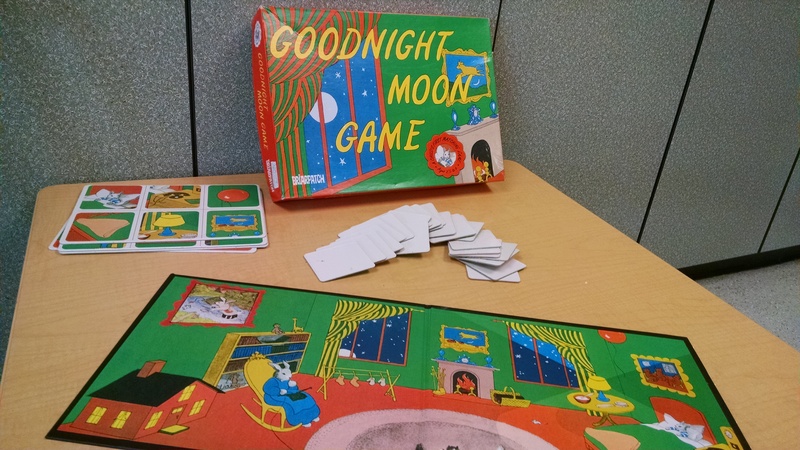 We put out multiple Solar System jigsaw puzzles, And the Goodnight Moon Game which is a simple preschool level ‘match the card to the picture on the board’ game. 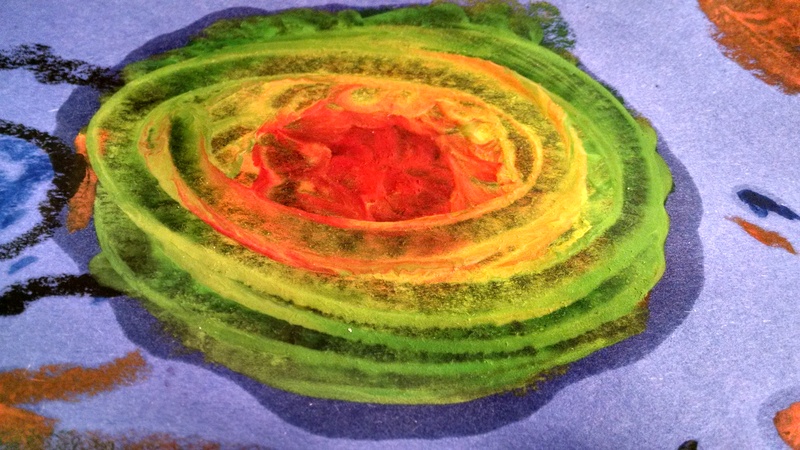 Snack – Kids make something that looks like planets. You could use English muffins split in half that they spread on whipped cream cheese and swirl in food colors. Or make pizza planets on the English muffin. Or decorate round sugar cookies with frosting. Or just serve the rocket shaped cheddar crackers and the star shaped yogurt-covered cookies from Trader Joe’s. Zoom Zoom Zoom, we’re going to the moon. In 5 – 4 – 3 – 2 – 1, Blast Off! Question of the Week: Each week, we post a Question of the Week (or more than one) on the board. I define the question this way: When the youngest child in the class walks out today, they should be able to answer this question in at least a basic way. Our questions this week were: What is a planet? What is a moon? What is a solar system? The very simple answers are: Planets are worlds that orbit (go around) a star, like our Sun. A moon is like a mini planet that orbits around other planets, like our moon orbits the Earth. A solar system is made up of all the planets and other things (moons, asteroids, comets and such) that go around a star. If something is very big or very far away it may be hard to conceptualize it and how it relates to other objects. Having a model can help. Night and Day: We turned on a lamp, and said it was the sun. We told them Teacher Cym was the earth, and we were all little people standing on her nose. She rotated to show them when the people saw the sun it’s daylight, but when she turns around, her nose is in her shadow, and it’s night-time for the people standing on her nose. After she demo’ed a few rotations, we had the kids do it. I think our 5 – 7 year olds understood the concept. Our 4 year olds had fun turning around, our 3 year olds didn’t get it at all. Lunar phases: You could use a flashlight, a large Styrofoam ball and a small Styrofoam ball to demonstrate how the sun’s light (the flashlight) shines on the moon and what we can see from Earth. If you do this, here’s some recommendations: one – put a pushpin or something on the Earth to represent “where we’re standing.” First have a child just hold the flashlight shining at the earth. Rotate the Earth around to show whether it’s day or night where we’re standing. Then have another adult hold the moon and move that around the earth, and talk about what the moon looks like from where we’re standing. This is a tricky demo to manage the physical logistics of, so practice it in advance. We talked some about space travel, and we ended by reading Roaring Rockets. (see below) Something for us older teachers to remember… most of the parents in our classes weren’t alive for the lunar landings, and most of our students weren’t alive when the space shuttle was flying. I’d love a young kids book on the Space Station or some of the private programs that are now working on space flight. 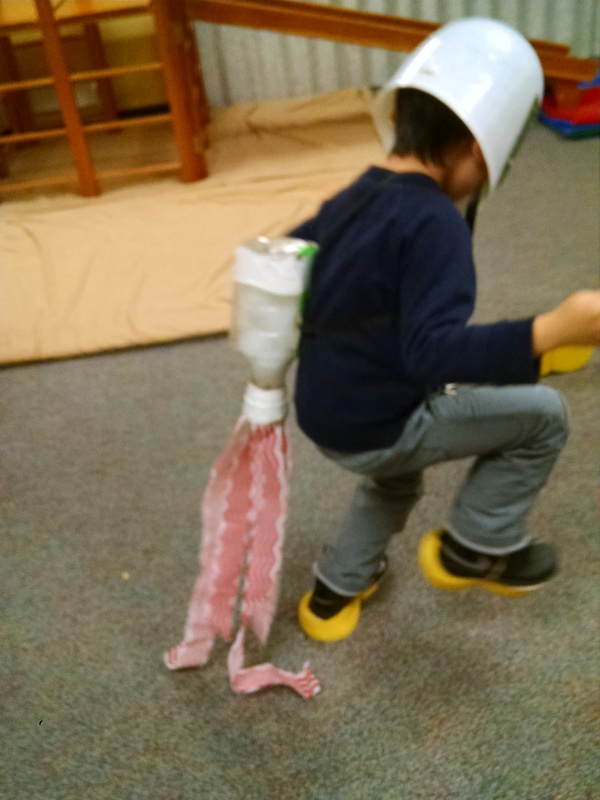 Rocket Ship: We set up a climber to be a rocket ship. You could even use something as simple as a step-ladder and a countertop where they could climb up to rocket ship. Planetary Surface: You could use gym mats or a bean bag or blankets and pillows to make a “planet”. On a playground, you can do something as simple as declare the slide to be a rocket ship, the ground to be the planet, and a picnic table with a keyboard and joystick on it as mission control. 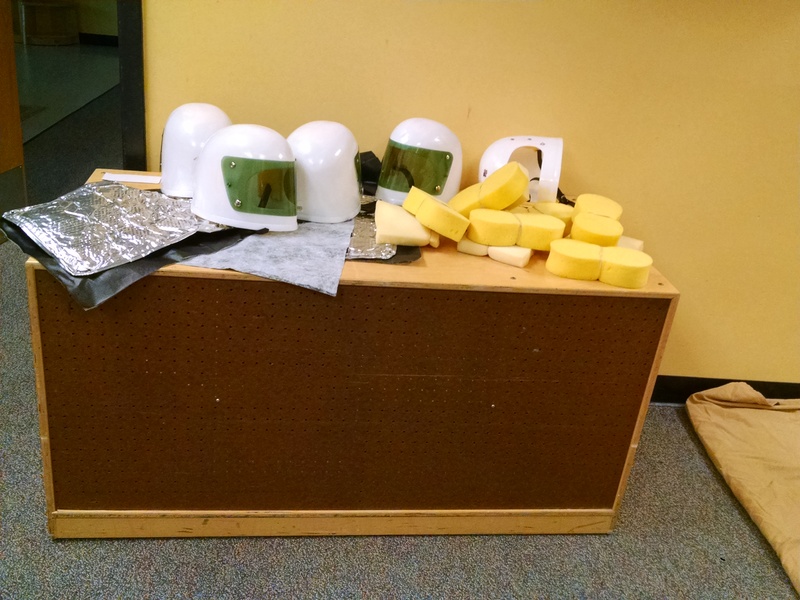 Dress-Up Items: We set next to the climber a collection of Space Helmets and a couple space suits (tabards with flattened aluminum pans on them, or silvery insulated bags with arm holes and neck holes.) They could also wear their jet packs they had made. Note: this pretend play will be more effective if they’ve read books or watched videos about how astronauts act and how space travel works. 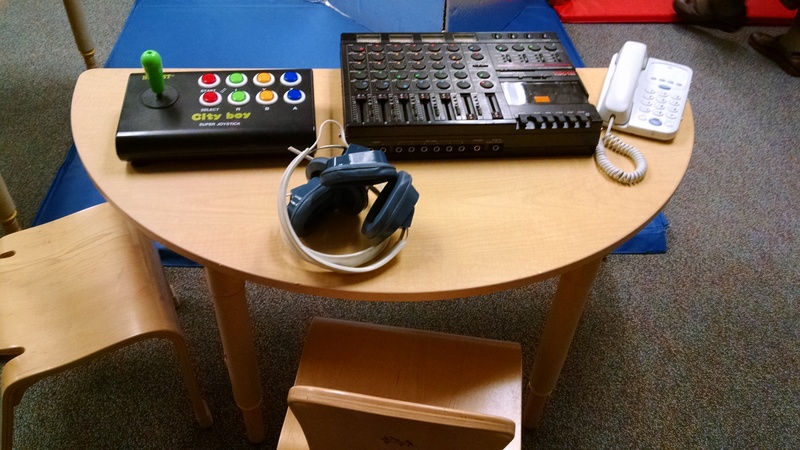 It also helps with this (and all pretend play, really) if an adult plays with the kids for a while to model how the pretend play could unfold. 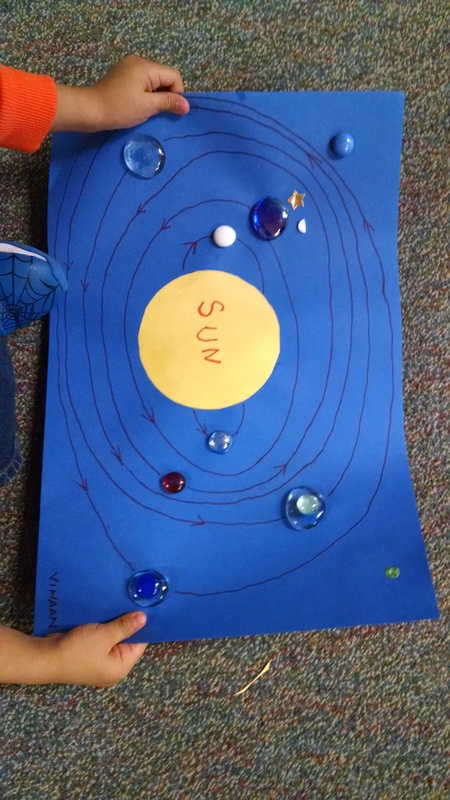 Solar System: We showed them an orrery – a 3-D model of the Solar system that shows relative sizes and orbits of the planets. 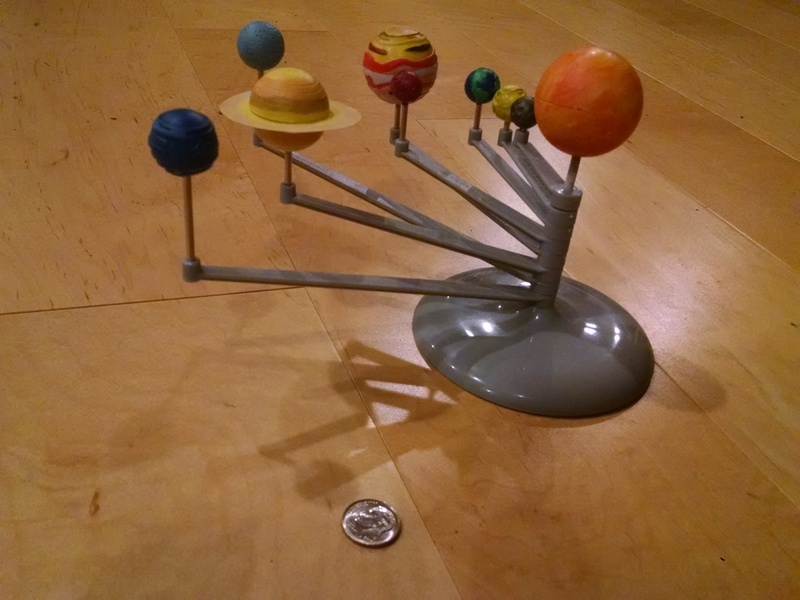 Ours was this inexpensive kit from Amazon – the dime is in the picture to give you a sense of scale (note: if you get one of these, be sure to pay very careful attention to which length of metal pin each planet gets mounted on – if you get it wrong, it’s hard for them to orbit past it each other properly.) This is for display only, as it tends to fall apart if three year olds pick it up and turn it upside down. 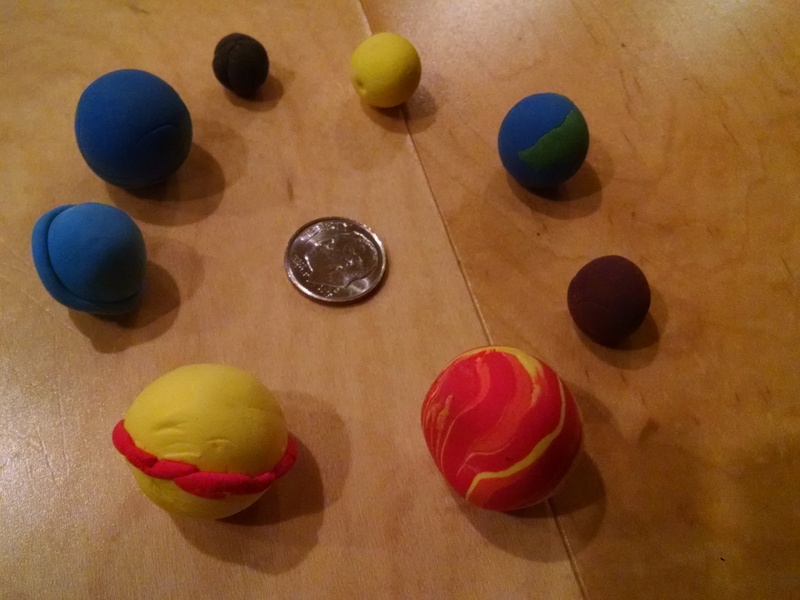 Planet Models: I have some model planets I made of Model Magic long ago. I brought them along for hands-on experiences during closing circle. They’re little (notice the dime for scale) and squishable so I had to tell the kids to be careful holding them and modeled how to hold them in their open palms, not squeezing them between fingers. Planet exploration: We used the orrery and the clay planets to talk about each planet – which is biggest – which is smallest – which is closest to the sun – which would be hottest – or coldest – which have rings. This is just to practice observation and categorization. Dance Party: We got the comet streamers we’d made out (and we had extras for anyone who didn’t make one). We put on this YouTube video of Zoom Zoom and danced around, singing along and waving our comet streamers. The video adds in this chorus: We can have a party on the stars with Mercury, Venus, Earth, and Mars. Jupiter might just sing a tune, with Saturn, Uranus and Neptune. Roaring Rockets by Mitton. A nice circle time book for ages 2 – 5, with simple rhyming text and a very basic intro to space travel. I Want to Be an Astronaut by Barton. Another simple preschool book on space travel – frankly I like Roaring Rockets better because there’s a rhyme and rhythm to that book, which is lacking in Barton’s text. But again, another good illustration of the very basics of space travel. Floating in Space by Branley – of the Hayden Planetarium. If you have a 5 – 8 year old who really wants to learn more about space travel, this is a good book for reading one-on-one, but way too long and detailed for use in class. Papa, Please Get the Moon for Me by Eric Carle is a lovely bedtime book with Carle’s great trademark art style but it’s definitely fantasy not science. Happy Birthday, Moon by Asch. Another gentle “bedtime-style” book where Bear imagines having conversations with the moon (really an echo). I read both these books to my son when he was three and again when he was five. At five he gets that you can’t climb a ladder and reach the moon and that the moon doesn’t talk to you and give you presents. But he still enjoyed these books, partially due to his delight in understanding that he has a more sophisticated understanding of how the universe works than these characters do. Mousetronaut by astronaut Mark Kelly starts with a true story of mice aboard the space shuttle, but then moves into fiction. Fine read. 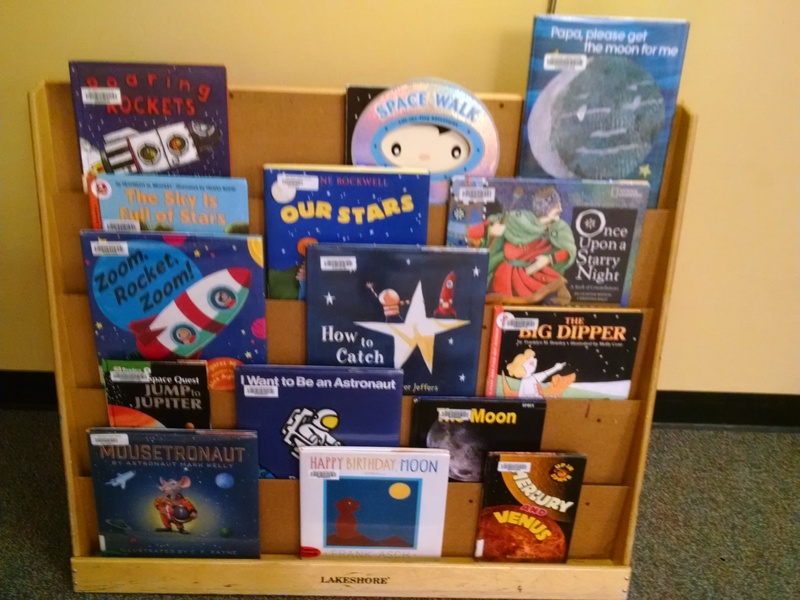 Solar System: There are many series of non-fiction books about planets, all of which have 8 books, with titles like “The Moon” or “Jump to Jupiter” or “Ringed Giant – the planet Saturn.” Go to your library, flip through them – see which series is best for your audience. Day and Night by Storad. Really nice explanation for 3 – 5 year olds. “Did you know we live on a moving planet? As the earth turns, it changes from day to night. The sun rises in the east and sets in the west…. Night is here. The moon rises. Some night we see a half moon…” Simple text, clear ideas, good photos. Faces of the Moon by Crelin, ill. by Evans. Poetic text: “The moon’s first phase, we call it NEW – when Moon’s between the Sun and you. Her sunlit side is turned away, and we can’t see her, night or day” followed by a brief timing note: “New Moon rises and sets with the sun.” Illustrations are great, with a graphic design where cut-outs in each page show the phase of the moon. (See below.) The text is best for age 5 – 8, but I can see using the illustrations with younger children. Would be a great companion to a moon journal project. 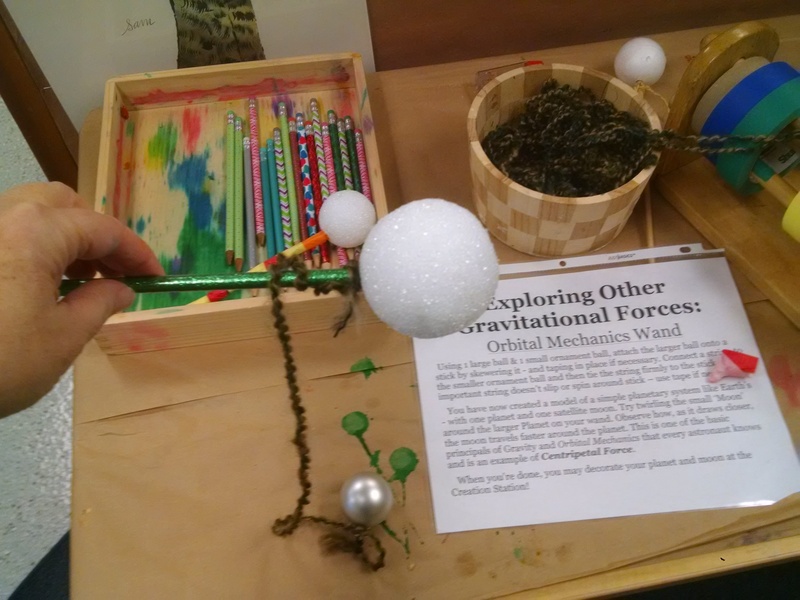 Includes an online teachers’ guide with a really nice group activity that models the phases of the moon by having a lamp in the center of the room to represent the sun and a Styrofoam ball on a stick to represent the moon. The child’s face is where they are on Earth. The child holds the moon in front of them, then they turn around (as the Earth does) and see how the light shining on the moon changes. The Moon Changes Shape (Tell Me Why Library) by Beaton. For 6 – 8 year olds. Overview of the basic ideas, told in the context of a boy’s summer visit to his grandparents’ farm and watching the moon change there. Would be a nice companion to moon journal project. Why Does the Moon Change Shape? (Tell Me Why, Tell Me How) by Stewart. For 8 – 10 year olds. Lots of content – more than would often be covered for this age group. 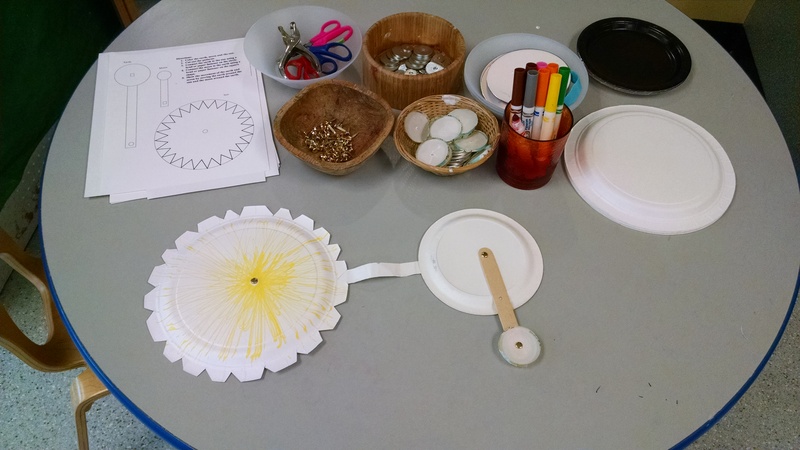 Take-Home Activity: We sent home a copy of this solar system mobile that kids could decorate, cut out and put together with parents’ help. (Note: making a mobile that balances is kind of an advanced engineering skill… ) It would be best to copy it on 11×17 card stock if that’s possible for you. There’s another solar system mobile here. An Astronaut Birthday Party: Many of these activities could be adapted to a kids’ birthday party. I’d do the pretend play (make a “spaceship”, mission control, and some simple costumes), make jetpacks and paper rockets, then launch a few Alka-Seltzer rockets. With the cake, be sure to serve Astronaut Ice Cream. You would think there would be good planet-themed apps. I haven’t searched recently, but two years ago, when I had a three year old who was wild about the solar system, I searched and searched and didn’t find anything worth bothering with. If you have one you like, add a comment! Dream English Kids Can You Name All the planets?